The Shee's lost knowledge: Generating arbitray In-game eggs from CAOS commands, while also investigating the Norn reproductive system. - A way to execute CAOS commands ingame, to test and probe stuff. I most exclusively use Chris' CCmdline tool for quick tests.It works with C1 and C2. Or the CAOS console found in BobTweak for C2 ( along with some other useful tools, be sure to check that one out if you don't know about it ). - An optional scriptorium browser for the appropriate game. It will make things easier, but you could also use hand crafted CAOS commands to retrieve the scripts you're interested in. My CKC available on this site also features a scriptorium browser for C1 and C2. - Some kind of Classification reference for the appropriate game, you'd better cross information from various sources as most are incomplete or contain mistakes. The one from the C2 Caos guide ? Once again my CKC tool features a labelled scriptorium browser. - Optionally a genetics kit, if you're really starting from scratch and don't know much about Creatures yet. You didn't think you'd be asking about that once again in your life , did you ? No seriously, in the Creatures games, babies or rather eggs, happen when Norns F**K.
I'm not being rude here, it really is the exact name for the CAOS command used to trigger "sperm donation" as it is poetically described in the C1 CAOS reference document. We'll begin our investigation from the end of the reproductive chain as this is what is of most interest to us : generating eggs. In Creatures, eggs are laid by the mother Norn when the pregnancy reaches its term. 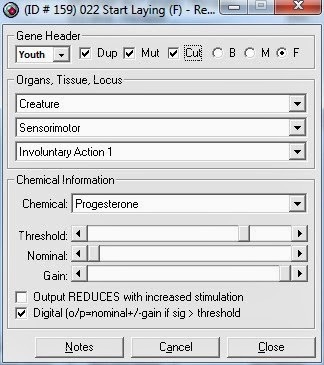 The Genetics kit sheds some light on the process if you check out the description for the "Progesterone" chemical. The description for this chemical reads "Produced progressively during pregnancy. When it reaches a threshold, it fires a receptor to cause the egg to be laid." In game mechanics terms, this chemical thresholds trigger a hardcoded "involuntary action". There's a few used involuntary actions in the game, such as sneezing, coughing, falling in a coma, laying an egg or ...dieing. There's also some free slots available for you to use if you want to implement new involountary actions to make your Norns more interesting. Open your C1 gen kit, load the mum1.gen genome, then navigate to the genes tab. Gene 159 is labelled as "start laying" and operates by reacting to progesterone levels as expected. We can see how it triggers "Involuntary action 1" when progesterone levels get over the expected threshold. We now know that this action is the one associated with laying an egg ( we must note this as not all tools do map involuntary actions so explicitly ). "Involuntary actions" as most other aspects of the game are managed by associated CAOS scripts. By browsing the game scriptorium with one of our tools, we can find the associated script either by name ( if available ), or by trying to locate unique pieces of code that we expect to find. 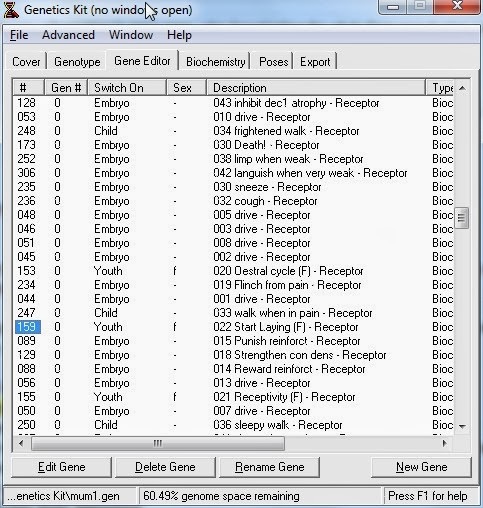 For example, without any documentation available, we could look for scripts that contain references to the egg sprites, to the "new: gene" command, or to the Egg classifier (2 5 2). The following script found as 4 0 0 65 will be our best candidate for the role. Here is a screenshot from the CKC's Script Archive applet, run in Scriptorium browsing mode, showing the EggLaying script known as 4 0 0 65. Oddly enough, the egg laying script is classified as "Creatures->All Creatures -> Both sexes -> Lay an egg". Meaning it's not a female specific behaviour. There's probably a good reason for that ( simplification ? possibility for new sexless species ?) but it won't really matter for our needs. Let's rather take a look at the script and see what it does. You can fetch the script with your favorite CAOS console tool by feeding it: "dde: scrp 4 0 0 65"
So what does all of this mean ? Is used to mean that the involuntary action should not retrigger before "255" delay. This stops the script if anybody is carrying the current object. Probably to avoid bugs with creatures currently carried by the "edit" CAOS command, so they don't lay eggs while flying. This bloc will be executed only if "Baby" is set. "Baby" contains the child moniker if current Norn is pregnant. This means all of this only happens if a Creature is pregnant. Even with a massive injection of Progesterone, an unfertilized Norn won't lay any egg. setv var2 limb # Put the lower creature's limit in global variable var2, this "finds the ground"
new: simp eggs 8 var3 2000 0 # Create a new egg,from "eggs" sprite, with 8 states,pick the appearance N°"var3"
# From now on, following the "new:" command, targ is no longer the mother but the egg. slim # Enables the egg "limits"
evnt targ # Triggers the "New egg" indicator in the status bar. So what does all of this teach us ? dde: negg # Use if you want that egg to count as one egg in game stats. We got rid of all uncontrolled stuff to replace it with our known wanted values.We also don't consider the new egg as a natural egg, so we don't update anything in the game interface. Additionally, we are still using a predefined and already existing (this is mandatory !) child genome moniker. for mono parental child generation. Before you get straight to making new eggs though, let's just see what happens to the newly laid egg. The "tick 900" command in the original scripts, sets the egg timer value to "900" once laid. You could further check the 2 5 2 9 ( Simple -> Eggs ->Norn Egg -> Timer ) script to see what happens once the egg gets into the world, but this is a much longer script. I won't cover it in this article, but what happens next is that at regular intervals the egg grows in size. Once the max size is reached, the next timer tick plays the "about to hatch" animation and sounds, and creates the new creature. The last timer tick then destroys the remaining egg shell after some time. That's it ! we now know how to generate our own eggs. Here are some CAOS snippets for the various creation scenarios you might want to use. We can spawn eggs at any state: small or grown. We can control the Egg's appearance. We can't control the eggs timer so it grows slower or faster, as this is reset in the timer script at each cycle. We can spawn Eggs anywhere we want them, or make them user placable. Yay! an egg out of nowhere from a CAOS command ! I hope this was interesting.Generating ingame egg files from arbitrary genomes can be an useful and practical addition to your Creatures mad scientist skillset. Also contrary to the egg file generation mechanism shown in a previous article, this not only is more practical for everyday use but also works with C1. All of these articles aren't purely coincidental. Once we've got all the bases covered, a future article will deal with massively and automatically mixing arbitrary genomes, and producing the corresponding eggs. Basically, I will show you how to write a script that takes a set of Norn genomes, simulate them breeding for an arbitrarly high number of generations, and then import ingame some of the resulting children. I use this possibility to check stability of my new genome/breeds over multiple generations, or to check long term compatibility when mixing various breed genomes. If you want to know more about that, stay tuned ! What went wrong exactly ? Was it a syntax error ?Or did the egg not behave as expected? The code samples should work as is, by just replacing the monikers, without any other edits.